moved locations this year....but not very far..
RV's, Tents & lawn chairs. adore bluegrass music. The live bands that grace the stage of the festival are immensely talented. from the Horseshoe Bay Ferry turn right after driving off the boat, head north..look for signs marking this fantastic event. like a trooper. 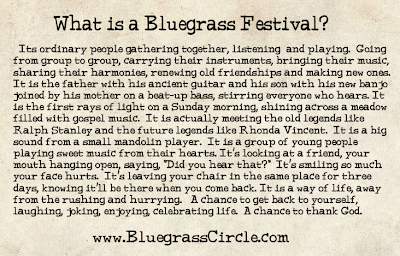 This is the roots of bluegrass.